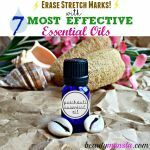 6 Best Essential Oils for Oily Skin, Application Tips & Recipes - beautymunsta - free natural beauty hacks and more! Find out 6 of the best essential oils for oily skin and how to use them to control sebum production! Have you got an oily & greasy face? I know I used to, especially when I was riddled with acne – I still have some acne on my cheeks but the oiliness has definitely decreased! 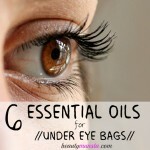 If you fall into the oily skin category, you must try using essential oils! Many essential oils have astringent and skin balancing properties that help minimize oily skin however, there are a specific few that are especially good for oily skin and can help normalize the skin’s natural oils. 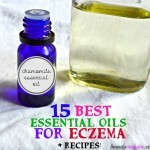 Check out 6 of the best essential oils for oily skin below plus some great recipes to try now! 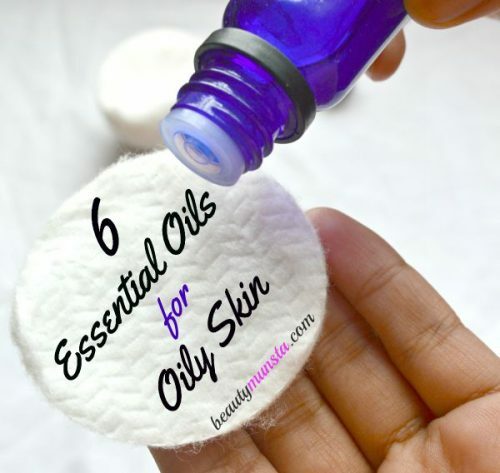 6 of the Best Essential Oils for Oily Skin & Recipes! The first thing I noticed when I used tea tree essential oil to treat my acne, was how oil-free and ‘clean’ my face would look and feel. Tea tree essential oil has incredible astringent properties that work in minimizing & regulating excess sebum production in the skin. ► Tea Tree Toner: In a amber spray bottle, add 1/2 cup of distilled water. Next add 1 tsp of witch hazel and 4 drops of tea tree oil. Shake well. Store in the bathroom cabinet. Spray onto your face with your eyes closed after cleansing your skin and patting dry. Moisturize as usual. Rosemary essential oil is popularly used in hair care to prevent hair loss and help re-grow hair. 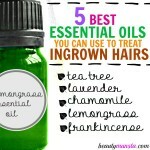 (I’ve talked about my experience with hair loss and rosemary hair growth recipes in this post). For oily skin, rosemary essential oil is one of the best. It helps balance oily skin and also has powerful antibacterial and antiseptic properties that keep whiteheads, blackheads, acne and other oily skin related problems away. ► Refreshing Rosemary Towelettes: These rosemary & basil essential oil towelettes are really handy to keep in your backpack/purse. Pull out one and wipe your oily face before reapplying makeup at any time of the day while you are at school or work. Good for normalizing sebum production in the skin, neroli essential oil is good for both oily and dry skin types. 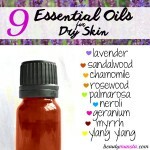 It’s one of the best essential oils for dry skin that I’ve talked about in this post. Apart controlling sebum, neroli essential oil is also great for healing any kind of skin inflammation including acne, eczema and psoriasis. It also smells OH-SO-GOOD so you’ll be smelling amazing while using it to control oily skin at the same time! ► Neroli Gel: I love using aloe vera gel to soothe and control acneic/oily skin! In a small mason jar, add 4 tbsp of aloe vera gel and 10 drops of neroli essential oil. Mix well and apply to your whole face at night before bed. Extracted from the bark of the cedarwood tree, cedarwood essential oil is another skin balancing essential oil that’s good for both oily and dry skin types. It’s also effective in treating oily and dry scalp problems as well. Cedarwood essential oil can be used to treat acne, rashes, eczema and other inflammatory skin conditions. ► Oil Control Cleanser: Fill a soap dispenser with ¼ cup of liquid castile soap. Then fill the bottle up with water but not too much (just a little more than ½ cup). Add 7 to 10 drops of cedarwood essential oil and shake well to combine. 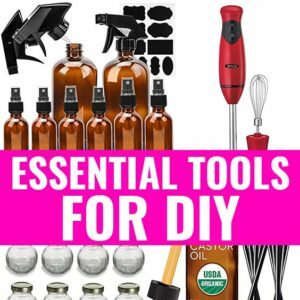 Also add 4 drops of geranium essential oil to give your DIY cleanser a gorgeous scent! Use this in place of your regular facial cleanser! Though not a very commonly used essential oil, fennel essential oil is actually one of the best essential oils for oily skin and it’s also effective against wrinkles & fine lines. This essential oil is extracted from the sweet fennel plant also known as roman fennel and it’s used in aromatherapy to dispel fears, boost courage& determination. It acts as a wonderful tonic for oily skin and it helps heal and nourish mature skin due to its estrogenic properties. ► Fennel Ice Cubes: Get 3/4 cup of distilled water, add 5 drops of fennel essential oil and stir with a glass rod/ spatula. Fill an ice cube tray with this essential oil infused water. Once completely frozen, its ready to use! First cleanse your face then wrap an ice cube in a hanky or soft cloth and dab it on your face to tighten pores and minimize oiliness. Lemon itself is a powerful home remedy for treating oily skin and hair. Now imagine how effective lemon essential oil is?! Being a powerful astringent, lemon essential oil reduces excess sebum on the skin, tightens large pores and keeps skin fresh and clean. It also has strong antibacterial properties making it effective against acne and blackheads. Lemon is photo-sensitive so only apply it on your skin when your not going to expose your skin to sunlight. ► Lemon Toner: Add 1 tsp of witch hazel to an amber spray bottle. Next add 4 drops of lemon essential oil. Fill the bottle with 1/2 cup of rose water. Cap tightly and shake well to combine. Mist it lightly on your face after cleansing then let it dry before using a moisturizer. You can try this water-based Green Tea Moisturizer for Oily Skin! First check with your doctor to see if essential oils are okay to be used by you if you suffer from hypertension, skin allergies and other medical conditions. If you are pregnant or breastfeeding and would like to use essential oils for oily skin, please first consult your doctor as most essential oils are not safe to use for pregnancy/breastfeeding. Fennel essential oil mentioned above must not be used if you are pregnant.